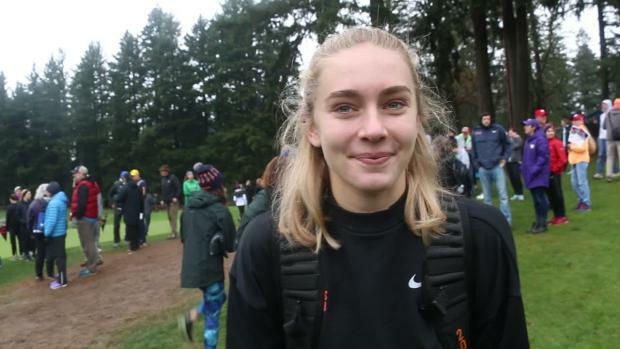 As I climbed the steps to get on the NXN bus in Portland, the only two thoughts in my mind were, "Whoa, this bus is huge," and more importantly, "This is going to be so much fun!" After choosing a seat, I made myself comfortable and stared out the window the entire way to the Nike Campus. Similar to my thoughts about the bus, my thoughts upon entering the Tiger Woods center were primarily about its massive size. However, once I got past my original shock I was able to take everything in. The uniforms, the banners, the room filled with the best athletes in the entire country, were all overwhelming and incredible. After finding my Southwest teammates in the sea of people, we headed over to gear up not realizing that my expectations for this moment were about to be blown away. 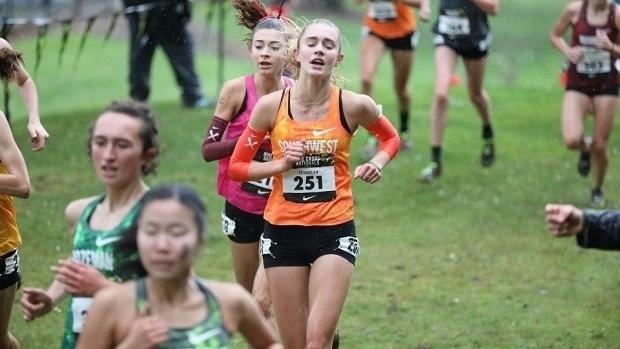 Together, we walked down a dark hallway toward a green light and as soon as we stepped out of the darkness we were greeted with music and a voice from the heavens welcoming us to Nike Cross Nationals. We were now on a stage facing closed curtains, eagerly waiting to see what was behind them. 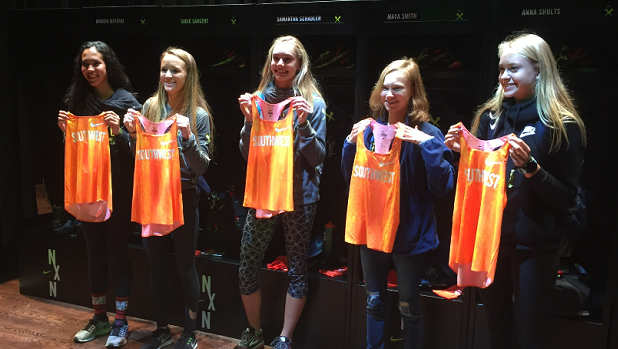 When they opened, standing in front of us were five lockers filled with tons of personalized gear -- every runner's dream. The next few moments were filled with excitement and photos, squeals, wide-eyed elation and absolute awe, until we were ushered out the other end of the stage (with our backpacks stuffed full of gear) and back into the main lobby. Our next stop was dinner, and after that was opening ceremonies. 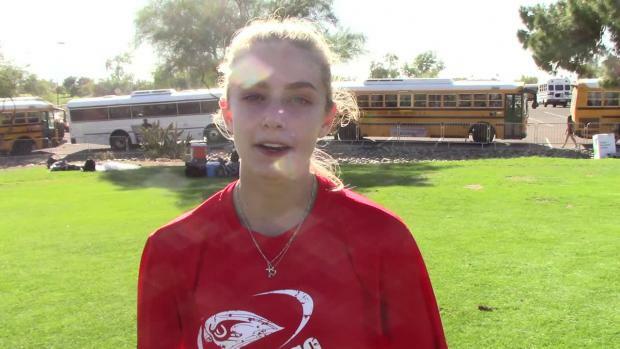 There was another rush of excitement when Shalane Flanagan and Evan Jager walked out on stage to interview each regional champion and the next hour was filled with introductions, questions, and laughs. By the time it was all over exhaustion had set in and it was time for much needed sleep in preparation for the thrilling days to come. On day two we visited the course, became familiar with all its ins and outs, visited the Athlete Village, hung out in the Athlete Lounge, listened to some more Nike-sponsored athletes speak, ate dinner, and then returned, exhausted yet again, to the hotel. 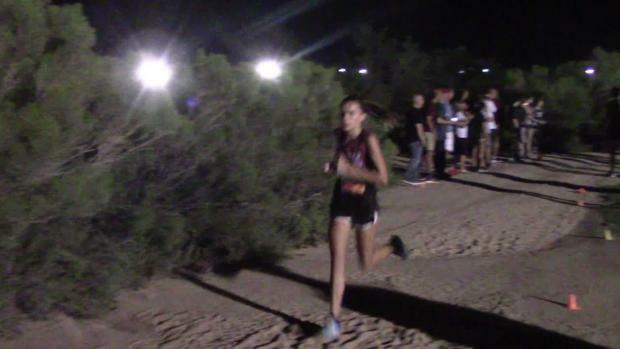 Bedtime came early as the long-awaited race was just a few short hours away. When race day finally rolled around everyone had been consumed by nerves. The bus ride to the course was silent and we filed into the Village one by one to get our things together and start warming up. Before I knew it, I was on the starting line tying my spikes, already muddy and slightly chilled in the mild 40-degree weather. It was time. The gun went off and we stampeded down the long fairway. The air was brisk and all I saw was a mass of girls and a blur of trees out of the corners of my eyes. The moment was here at last. We were finally racing. After the race was over pure exhaustion could be seen on the face of every single girl who crossed the finish line. We had given the race everything we had and nothing less. After six months of training, racing, hard workouts, and mental preparation, it was all over. 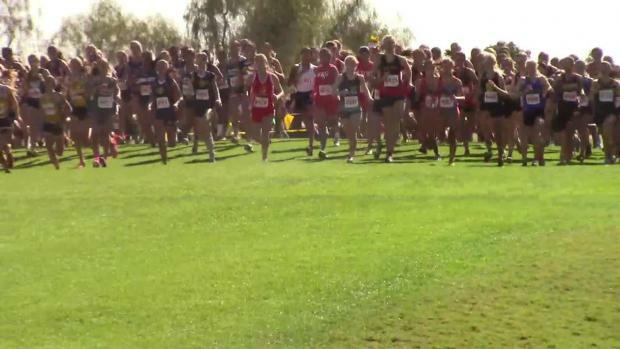 Nike Cross Nationals was a success, and I, along with every other athlete, could go home knowing that all the hard work, pain, and commitment that had been given during the season was one hundred percent worth it.